Absolutely would buy my canvas again!! It was a gift to myself!! It more than met my expectations! Can't really appreciate the beauty of it until you click on the lights! Thank you so much! This canvas is very pretty, understated, and useful even after the holidays. I like the muted colors and soft lighting. Very pleasant and charming! I was totally surprised by just how beautiful this is. I didn't expect the flickering lights to look so realistic! There is an on/off switch, easy to reach on the side. but don't pass this up, it makes one happy to look at it! i would probably buy this again. pretty. but goes through batteries like crazy. I think that they are beautiful. I never seen anything like this. This is a beautiful picture. I got this for my sister. I know she will be happy when she gets it for Christmas! I like these pictures and the price was right. I love putting cables all over the house for the holidays. This canvas will look beautiful on my wall, during the holidays! Will give the house a warm ambiance. 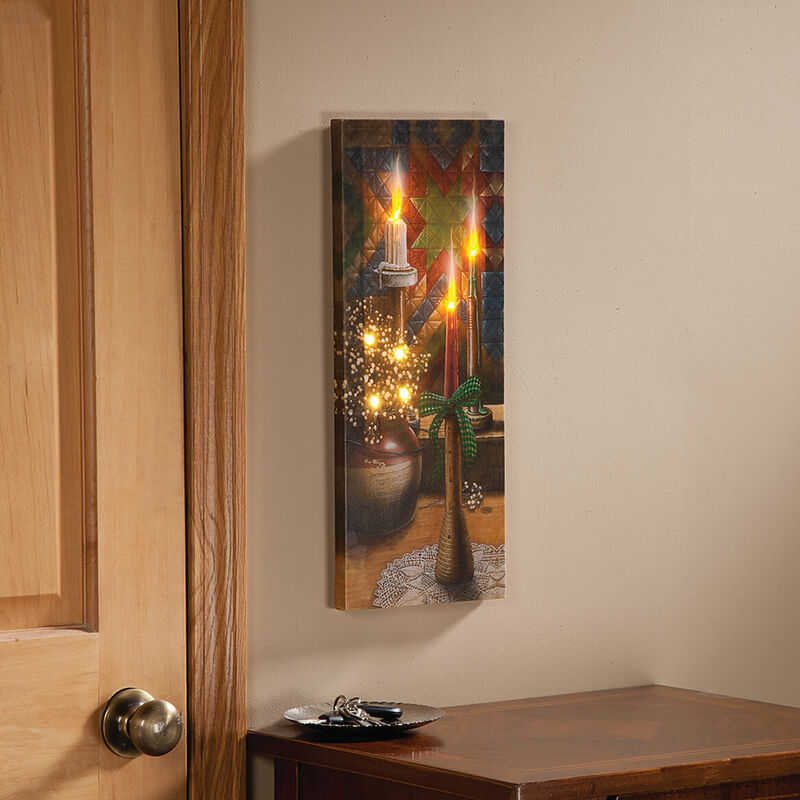 The lights on this canvas gave me a warm feeling that is so appropriate at this time of year. The moment I saw it on the page, I knew just where it would go in my home. 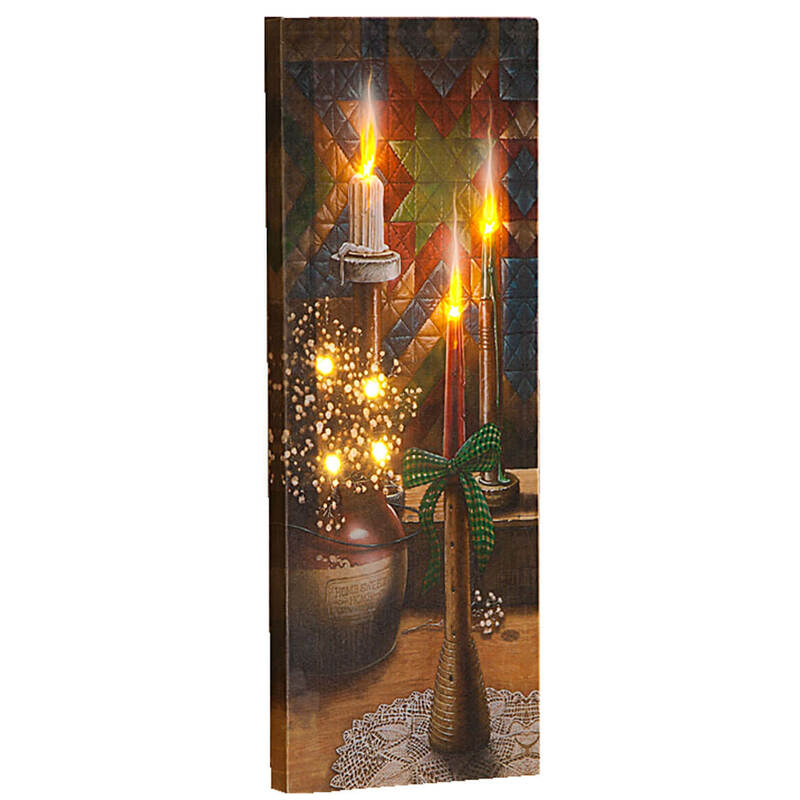 I've purchased Doug Knutson Candlelight Christmas cards for 2016 and love them. I'm hoping to enjoy this canvas just as much. Very popular item and liked the photo. I love this beautiful picture, so warm and welcoming. My grand daughters mother in law will love this picture. exactly what I need to decorate my hall, and the lights will be just enough for the christmas ambiance. the price was also very good. THIS IS BEAUTIFUL, AND THEY ARE GREAT AND CALMING IN THE DARK. Will look beautiful as part of holiday dÃ©cor. A nice seasonal display. I have seen a similar one at a friends and it looked very nice. this picture makes you feel warm and cozy on a cold night. Looks beautiful and will enhance Christmas dÃ©cor. to add to room decorations. Size of the wall hanging. Does it operate on batteries? BEST ANSWER: Thank you for your question. The canvas is 19" long x 8" wide and works with 2 AA batteries that are not included. We hope this information will be of help to you.